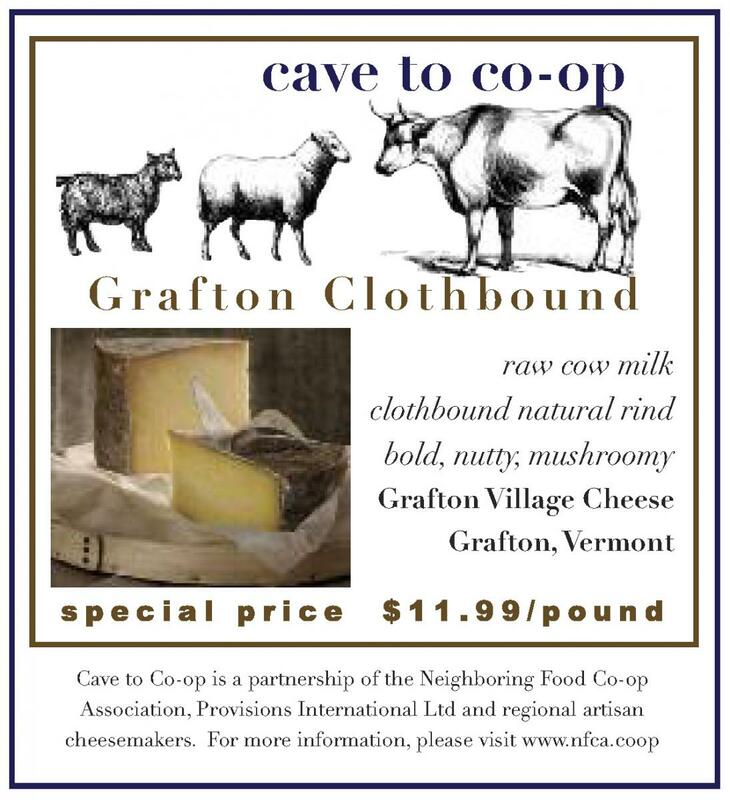 This month's special cheese is GRAFTON CLOTHBOUND CHEDDAR from Grafton Village Cheese, Grafton, VT. The Grafton Village Cheese Company was founded in 1892 as the Grafton Cooperative Cheese Company, to convert surplus milk from local dairy farmers into cheese. In 1912, the cheesemaking factory burned down and the community had no cheese facility until 1962, when the Windham Foundation restored the factory and brought cheesemaking back to the community. The Foundation is dedicated to promoting the rural communities of Vermont. The profits from Grafton Village Cheese go back into the Foundation to further its commitment to keep rural Vermont alive and thriving. Today, quality and taste are still the hallmarks of the company's products. Clothbound Cheddar is classic milled curd cow milk cheddar wrapped in cheesecloth while it ages slowly in Grafton’s caves for a minimum of six months. Grafton Clothbound delivers a very bold cheese with both nut and mushroom notes. Grafton Clothbound is delicious this time of year and serving it with a piece of ripe local apple or pear would be just about perfect. We also recommend it in the kitchen, and here are a few autumnal recipes to try out. Heat 2 tablespoons oil in a large heavy pot over medium heat. Add onion and cook, stirring occasionally, until soft but not browned, 8–10 minutes. Add garlic and cook, stirring constantly, until fragrant, about 1 minute. Add butter and stir until melted. Add flour and cook, stirring constantly, until beginning to turn golden brown, about 4 minutes. Whisk in broth, beer, and cream. Bring to a boil, reduce heat, and simmer, whisking occasionally, until thickened, 10–15 minutes. Reduce heat to low and whisk in cheese a handful at a time, whisking to combine after each addition. Cover and let sit for 10 minutes to ensure cheese is melted. Working in batches if needed, transfer soup to a blender and purée until smooth (alternatively, use an immersion blender in the pot). Season with salt and pepper. Using a paring knife, score sausage, spacing cuts ½” apart. Heat 1 tsp. oil in a large grill pan or skillet over medium-high heat. Cook sausages, turning occasionally, until browned and crisp in spots, 8–10 minutes. Transfer to a plate. Toss apple in remaining 1 tsp. oil in a small bowl. Cook in same grill pan until softened and slightly charred on both sides, about 2 minutes per side. Divide soup among bowls; top with sausage and apple. Combine the apples, lemon juice or cider and the 1/3 cup of brown sugar in a medium bowl. Arrange evenly in an 8 or 9 inch square baking pan. In another medium bowl, combine the oats, flour and spices to mix. Cut in the butter until the mixture is crumbly and forms pea size little lumps. Gently mix in the cheese. Sprinkle this mixture evenly over the apples and bake for 35 to 40 minutes until the juices bubble up and the top is nicely browned. Let rest for 10 minutes and serve with heavy cream.